You know how there are certain couture gowns, say, by John Galliano or Alexander McQueen, that are so beautiful and seemingly perfect, you don't think of them as even having designers? Nor do you think of them as being sewn by human hands, or even having seams? In fact, they just strike you as perfect objects that must have sprung ex nihilo from thin air. That is Fracas for me. I always forget how beautiful this perfume is, how much it deranges my senses, confuses my ability to grasp the notes, so quickly do they swirl into an impression that signifies only one thing: beauty. Fracas is just a stunning perfume. There is a world with its own atmosphere in every Germaine Cellier fragrance, particularly her iconic fragrances Vent Vert, Bandit, and Fracas. If Vent Vert made me think of Nijinski and other dancers rushing headlong onstage to dance to Stravinski's the Rite of Spring, Fracas makes me think of showgirls rushing backstage after dancing in some burlesque revue, so many beauties (representing a cacophony of perfume notes) at so many angles, coming at me in so many different directions, I cannot count them. It is a blur of beautiful white flowers, whose friction creates what smells to me, for a moment, like cinnamon. Creamy, sweet, spicy, almost as if there were cloves interwoven in a garland of white flowers. Luca Turin, in Perfumes the Guide, said that Vent Vert had over 1,000 ingredients in its chemical composition, but because it was so masterfully constructed, it smells like something natural. You just smell "spring," or "bent, peppery stems" or "galbanum and rose." It tricks you into think that something straight out of nature is shoving its way into your perception. Fracas is the same way with its deluge of white flower notes resting on the creamiest, most decadent bed of tolu balsam, orris, oak moss, sandalwood and musk — an almost gourmand version of white flowers. Oh, magnificent Germaine Cellier. How wonderful it would be to have known you. 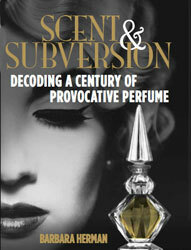 For those unsure if perfumes can mean anything (much less be subversive), take a whiff of Fracas. Very insightful review. I love Fracas, and am considering buying one of the "vintage" (well...mid 80s era) bottles off ebay. Have you tried any of the earlier versions before it was re-released in the late 90s? (i think that was when it was re-released) I wonder how they compare...I've only tried the reformulated version myself. Love your site btw! rk: I have a 60s or 70s version and compared it with a sample of the reformulation I got at Nordstrom. The reformulated is watery compared to the rich, lush, decadent, older Fracas. Hold out for the vintage...they're relatively easy to find on eBay and not that expensive. Glad you're enjoying the site —go for vintage Fracas and come back and tell us what you think! Fracas, in French means to "roar". This is a fragrance of distinction,refined sensuality. It is so beautiful you cannot even imagine it is even of this world! That someone was the "nose" behind it. It just seems to me like a work of Michangelo. You know of his artwork, and the Sistene Chapel. Like a legend, or folklore. Fracas roars in your mind. It speaks for you, not against you! One of the best perfumes ever created! Thank you Germain Cellier! Roar onward Fracas..forever!